Beyond the Stars was the whole school production for 2018. We are so lucky to have Mrs Jemma Van Eijk, who writes, directs and choreographs the whole show. The story is baout a planet called Abideon where everyone has to dress the same , act the same and be the same. A group of "cadets" experiment with building a spaceship and find themselves shooting through the universe. They land at an E-Cluster Spectacular - a festival celebrating the differences of its various member planets; Pacifa, Americano, Laurasia and Eurotopia. Each "planet showcases these cultural identities and unique qualities through dance and costume. The "cadets" finally return to Abideon keen to celebrate everyone's diversity and unique characteristics and to "Change the World". 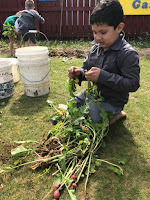 With Spring now here, it is time to rotate the crops in our Community Garden. 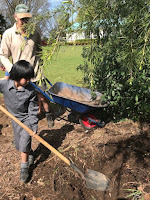 The seeds that we planted at the beginning of the term were now ready to transfer into the gardens. Last week we cleared the carbon crop gardens and prepared the new compost heap. At 11am today, joined by Gordon from Transition Matamata and Tamara, everyone had specific jobs to do in order to prepare the new beds. Plots needed to be dug over and compost added from our compost heap; old plants removed or transferred to their new garden; new seedlings and potatoes planted and carbon crops sprinkled such as pumpkin seeds to add nutrients to the soil. A good watering to finish things off and now we wait for the crops to grow. On Tuesday 10th April we went to Kingswood. We did not walk because it was raining very hard and the wind was too strong so we drove to Kingswood. When we got there we waited outside for them to let us in. We sang 10 songs to the people. They clapped with us. After we finished singing we got lollies and a drink. Then we drove back to school. On a cold morning the year 4-6 children walked to Pollen Park for Leadership Day. 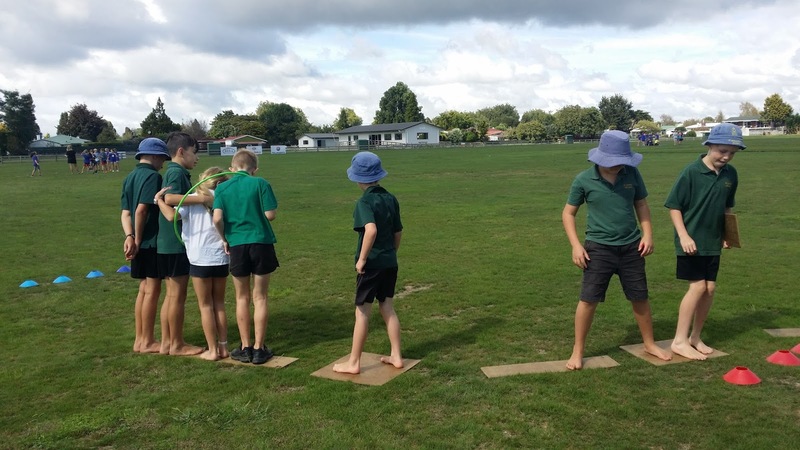 If you don’t know what Leadership Day is it’s when all the schools (year 5-6) join together and do team building activities. At the start we drew stuff that involves our school on the New Zealand Commonwealth Games mascot paws. After we had morning tea and we started the games. We did about 6-7 games and my favourite one was marsh manoevers. To play this our whole team had to get across the field, walking on pieces of wood, and we could not touch the grass. Over all it was very exciting with teamwork and memory games. Young Vinnies 28th of March. Young Vinnies is a fun group that the year 5s and 6s at St. Joseph's School gets to do. We have activities like plays and baking. This year the Young Vinnies sang “Don't Sit Under the Apple Tree”, “Hippity, Hoppity, Flippity, Floppity, Funny Bunny” and “Little Einstein” theme song (but we forgot to do that one). Ryan was a bunny, Patrick was an evil brown bunny, Joe was a pink bird, Tyler was a blue bird and I was a red bird. We did it at Pohlen Hospital on 28th March. After the songs we gave them Easter eggs and cards with jokes. Jack; oh about two kilos. On Monday 19th of March the whole school went to Te Aroha to celebrate St Joseph’s day with Morrinsville, Waihi, Paeroa and Te Aroha. At the start of the day everyone went to church for mass and Father JeLo showed us a picture of St Joseph sleeping. After that we did a bunch of activities like soccer, 4 square and an obstacle course. But before that we had lunch. Some people got to order lunch which they enjoyed. After that we went back to school – and everyone felt exhausted from all the fun activities that we did. We walked across to the town pools and most of the parents were there so we started. The little kids started and they went across the pool. Then the middle swimmers went 2nd. Then the big swimmers went last. It was a big long day when everyone got out of the pool their arms were tied. In the Interschool Swimming Sports, the first race was the 50 meter. The tent we sat under was the Firth Primary’s. They were so generous to let us share. The food was so nice. There was home baking, burgers and sausages but the races were fast and fun. When the races got called we had to go to the white tent and wait for our races. I was so proud of my achievement.